A reliable source of electrostatic charge can be made with the type of push-button piezoelectric igniter used in many portable propane gas barbecue grills. These are available from a hardware store for about $12.00. 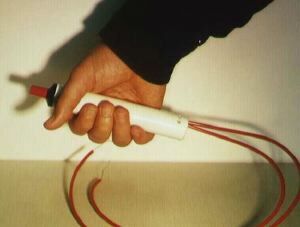 A convenient hand-held unit can be made from a short length of insulating PVC pipe, with the piezoelectric igniter mounted in one end and the two high voltage wire leads coming out the other end. Unlike the electrophorus and other triboelectric schemes, piezoelectric sparkers are fairly insensitive to humidity. They can induce ~0.25" (~6 mm) sparks at an estimated voltage of ~15 kV, which are usually quite sufficient to ignite flammable hydrocarbon vapors. These sparkers are very handy to have as a backup on those humid days when the electrophorus is not working well. When used with the vapor ignition demonstration, the piezoelectric sparker produces good sparks most reliably if the sparking balls are replaced by wire electrodes in the ignition chamber. NOTE: While piezoelectric sparkers are not particularly dangerous, they can deliver a rather painful electrical shock, so they should always be used with care.